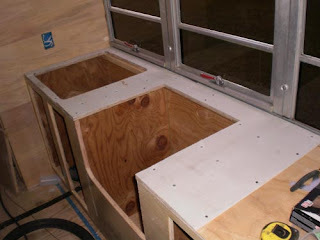 Today, (because of weather keeping me inside) I decided to start on the kitchen counters. 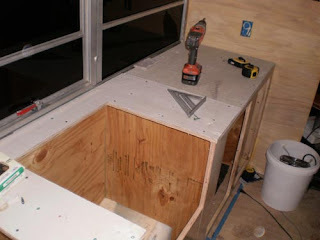 I already had a piece of plywood cut so I just had to cut out the sink and stove openings, glue it and screw it into place. After that was done I cut out and screwed the hardy backer in place. It is ready for tile. Maybe I can get the tile installed tomorrow.